The Startups Awards 2017 winners have been announced, with 18-month-old 100% renewable energy provider Bulb awarded the overall prize of The Start Up Loans Start-up of the Year. 77 of the UK’s most inspiring and transformative start-ups were selected as finalists for the industry’s leading, and longest running, annual start-up awards. Across 16 categories, 13 businesses received winning titles and a further 24 new businesses were awarded Highly Commended and Commended titles. 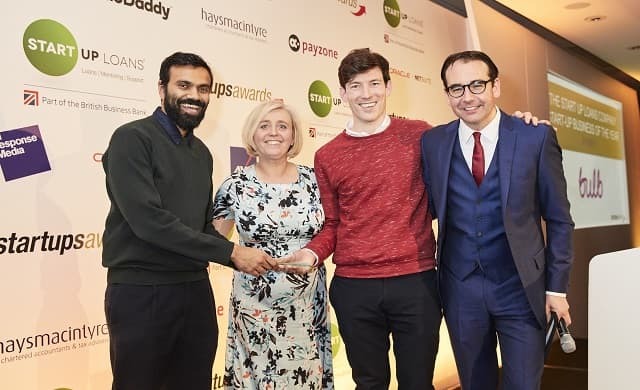 The biggest event of the UK start-up calendar, this year’s winners were revealed at the prestigious Startups Awards ceremony at the Royal Garden Hotel, London on Thursday 30 November, hosted by StartUp Britain co-founder Oli Barrett MBE. Running for its 14th year and organised by Startups.co.uk, the Startups Awards 2017 is backed by headline sponsor The Start Up Loans Company, alongside sponsors haysmacintyre, AXA Business Insurance, Payzone, GoDaddy, Oracle + Netsuite, and All Response Media. The awards showcase the most exceptional privately-owned UK start-ups launched in the last four years, and was judged by a star-studded roster of successful entrepreneurs, investors and business leaders. Judges included Liz Earle MBE, Ella’s Kitchen founder Paul Lindley, Dragons’ Den star Touker Suleyman, BGF Ventures partner Simon Calver and Vita Coco CEO EMEA Giles Brook. Facing off stiff competition from the winners of other categories, Bulb – which also took home the inaugural Founders Pledge Social Impact Award – won praise from the judges for taking on an established industry with a fresh approach which has attracted more than 100,000 customers. The winner of the People’s Champion Award 2017, which amassed a record-breaking 40,000+ votes, went to shaving subscription brand Cornerstone – its third People’s Champion win is as many years. Businesses also crowned Startups Awards winners on the night included Welsh start-up Infinity Trampoline Park, which scooped The Start Up Loans Inspiring Entrepreneur of the Year, and Trouva; the marketplace for independent boutiques, named Venture Funded Business of the Year. Proof that age is not a barrier to starting a business – and evidence of the UK’s inspiring female entrepreneurs – 65 year-old Tricia Cusden of Look Fabulous Forever took home the Women in Business Award, while 25 year-old franchisee Hannah Drury of Caremark, Sutton bagged Franchisee of the Year, and 29 year-old Pip & Nut founder Pip Murray scooped Young Entrepreneur of the Year. You can learn more about the Startups Awards 2017 winners and the businesses named Highly Commended and Commended here. For press enquiries, please contact grace.garland@mvfglobal.com.